The NEXT Prophecies DVD has finally arrived!...We are excited to introduce the latest Bill Salus teachings to you. Three timely and powerful prophetic video messages have been produced into a 2-disc DVD called, The NEXT Prophecies. This DVD is the teaching companion to The NEXT Prophecies book and it includes many PowerPoint slides and videos. Some people are saying,...“These are the best presentations Bill has ever made…”. The NEXT PROPHECIES 2-disc DVD is the teaching companion video for The NEXT PROPHECIES book, which is the sequel to The NOW PROPHECIES book and DVD. Christian Martyrdom, (The Fifth Seal Saints). The NEXT PROPHECIES DVD prepares the reader for powerful future world events! Don’t get LEFT BEHIND to face The NEXT PROPHECIES! 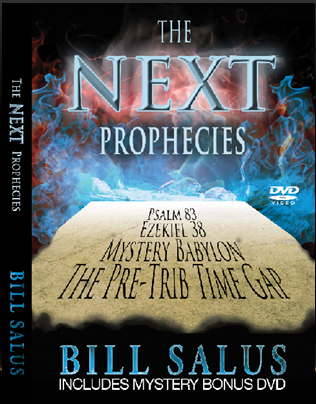 Order The NEXT Prophecies DVD for $15.95 and get a FREE autographed Bill Salus book entitled, Psalm 83: The Missing Prophecy Revealed, How Israel Becomes the Next Mideast Superpower. Prophecy Watchers TV show provides the literal interpretation of the prophecies in Ezekiel 38 and 39. Many prophecy teachers believe that Ezekiel 38 could happen now, but Bill Salus points out that the literal interpretation of the prophecies requires a greater and safer Israel. Ezekiel 38 won't happen until the greater and safer Israel becomes a reality. Find out how and when Israel meets the actual descriptions of Ezekiel 38. Is Ezekiel 38 a NOW or NEXT Prophecy? IRAN is in Ezekiel 38, but why NOT their PROXIES?